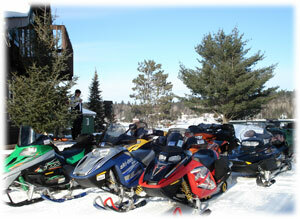 The Abitibi-Temiscamingue region is a great region for snowmobiles and ATVs due to its great climate. During wintertime, there is tons of snow and a dry climate which allows for one of the longest snowmobile seasons in Quebec. 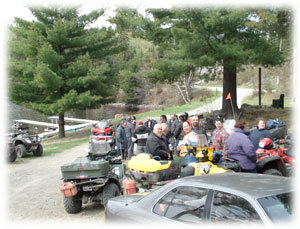 The Trans-Quebec #63 trail , qualified as a highway due to its length that can reach up to 24 feet belongs to one of the best network of snowmobile and ATV trails in Quebec and even in North America. The trails belonging to the Abitibi-T�miscamingue regional network account for 11% of the provincial network and offer over 3700 km of . These trails are renown for the quality of their maintenance and their road signs and information. Revitalize themselves with food, drinks and information at our restaurant/bar. Gather with friends and/or coworkers in our private party or meeting room. Fondu and raclette available, please call for reservations. Offer themselves a one week vacation or other type of stay (depending on the availability of cabins) to enjoy their sport in a picturesque environment.